رودی, حمیدرضا, همزه, یحیی. (1394). شناسایی پارامترهای کیفی و کمی کاغذسازی الیاف خمیر OCC. 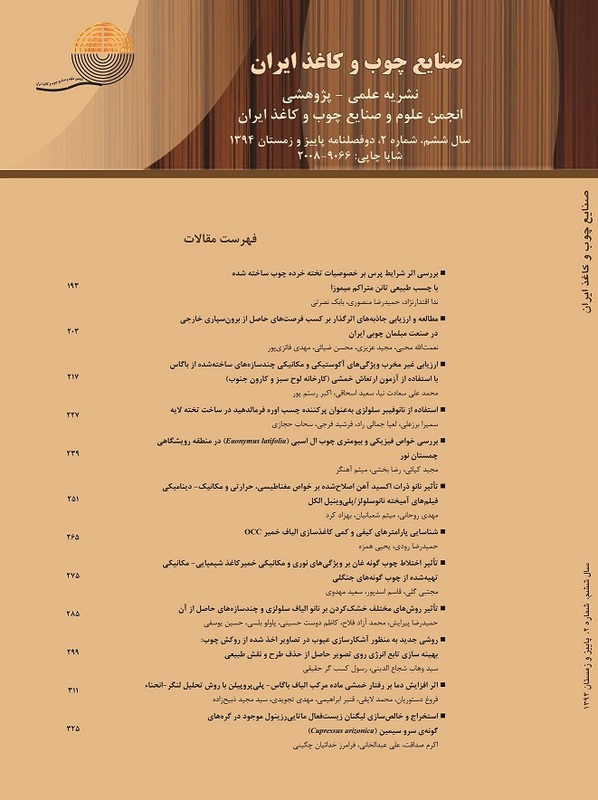 مجله صنایع چوب و کاغذ ایران, 6(2), 265-274. حمیدرضا رودی; یحیی همزه. "شناسایی پارامترهای کیفی و کمی کاغذسازی الیاف خمیر OCC". مجله صنایع چوب و کاغذ ایران, 6, 2, 1394, 265-274. رودی, حمیدرضا, همزه, یحیی. (1394). 'شناسایی پارامترهای کیفی و کمی کاغذسازی الیاف خمیر OCC', مجله صنایع چوب و کاغذ ایران, 6(2), pp. 265-274. رودی, حمیدرضا, همزه, یحیی. شناسایی پارامترهای کیفی و کمی کاغذسازی الیاف خمیر OCC. مجله صنایع چوب و کاغذ ایران, 1394; 6(2): 265-274. امروزه رقابت زیادی برای تولید کاغذهای بسته بندی از الیاف بازیافتی وجود دارد. امّا موفقیت در این رقابت در گرو بهبود ویژگیهای مقاومتی آن است. لذا زمانیکه صحبت از الیاف بازیافتی به میان می آید، اولین و مهمترین چالش مناسب سازی آن برای خمیر وکاغذسازی است. جهت دستیابی به این هدف اطلاعات کمی و کیفی کاغذسازی الیاف کاغذهای باطله کمک زیادی خواهد نمود. از اینرو در این تحقیق، برخی پارامترهای کاغذسازی همچون میانگین و توزیع طولی الیاف، نوع و میزان خمیر و نیز میزان نشاسته موجود در الیاف بازیافتی OCC مورد ارزیابی قرار گرفت. نتایج نشان داد که الیاف آن دارای پراکنش نایکنواخت طولی و بیش از 85 درصد الیاف، میانگین طول کمتر از یک میلی متر و در دامنة 0.65-0.47 میلی متر دارند. بی شک، این نایکنواختی توزیع طول الیاف و میانگین پایین آن باعث افت ویژگیهای مقاومتی کاغذ خواهد شد. رنگ آمیزی الیاف با معرف رنگی Graff ″C″ نشان داد که بخش عمده الیاف و در حدود 72.91 درصد مربوط به خمیر کرافت و بیشتر از منابع سوزنی برگ (33.33 درصد) می باشد. همچنین مقدار نشاسته استخراج شده از کاغذ 0.25±2.32 درصد اندازه گیری شد. باید درنظر داشت این مقدار نشاسته می تواند در فرآیند بازیافت، تعادل بار الکتریکی پایانه تر ماشین کاغذ را شدیداً تحت تأثیر قرار دهد. Malton, S., Kuys, K., Parker, I. and Vanderhoek, N., 1998. Adsorption of cationic starch on eucalypt pulp fibers and fines. Appita Journal, 51(4):292-298. Billosta, V., Brandstrom, J., Cochaux, A., Joseau, J.P. and Ruel, K., 2006. Ultrastructural organization of the wood cell wall can explain modifications caused in fibers during the pulping process. Cellulose Chemistry and Technology, 40(3-4):223-229. Atalla, R. H., 1977. The full potential of native cellulose fibers. Southern Pulp and Paper Manufacturer, 40(8):12-15. Haggkvist, M., Li, T. Q. and Odberg, L., 1998. Effects of drying and pressing on the pore structure in the cellulose fiber wall studied by H-1 and H-2 NMR relaxation. Cellulose, 5(1):33-49. De Ruvo, A. and Htun, M., 1981. Fundamental and practical aspects of paper making with recycled fibers in The Role of Fundamental Research in Paper Making. 7th Fundamental Research Symposium held at Cambridge, September, England, p 195-225. Ghasemian, A., Ghaffari, M. and Ashori, A., 2012. Strength enhancing effect of cationic starch on mixed recycled and virgin pulps. Carbohydrate Polymers, 87:1269–1274. Scallan, A. M., 1998. Mechanisms of hornification. Proc. Improvement of recyclability and the recycling paper industry of the Future. Nov.24-26 La Palmas de Gran Canaria, Spain, p 312-314. Ellis, R. L. and Sendlachek, K. M., 1993. Recycled versus virgin-fiber characteristics: A comparison in Secondary Fiber Recycling. R. J. Spangenberg (ed. ), TAPPI Press, Atlanta, USA, p 7-19. Hubbe, M. A. and Zhang, M., 2005. Recovered kraft fibers and wet-end dry-strength polymers. Proc. TAPPI 2005 Practical Papermakers Conf., TAPPI Press, Atlanta, digital document. Gerspach, W., Luo, C. and Gottsching, L., 1993. Modeling of the age distribution of fibers in recycling systems. Papier, 47(6):288-299. Hubbe, M.A. and Heitmann, J. A., 2007. Review of factors affecting the release of water from cellulosic fibers during paper manufacture. BioResources, 2(3):500-533. Etzler, F. M., Buche, M., Bobalek, J. F. and Weiss, M. A., 1995. Surface free energy of paper and inks: Printability issues. Proc. TAPPI 1995 Papermakers Conf., TAPPI Press, Atlanta, USA, 660 p.
 Watanabe, A. and Mitsuhiro, S., 2005. A report on an investigation of recyclability of troublesome paper materials in the paper recycling process. Tappi Journal, 59(7):17-32. Hubbe, M. A., Rojas, O. J. and Venditti, R. A., 2006. Control of tacky deposits on paper machines – A review. Nordic Pulp Paper Res. J., 21(2):154-171. Clark, J. A., 1985. Pulp Technology and Treatment for Paper. 2nd Ed., Miller Freeman, San Fransico, California, 97p. Ackermann, C., Gottsching, L. and Pakarinen, H., 2000. Papermaking potential of recycled fiber. in L. Gottsching H. Pakarinen (eds. ), Recycled Fiber and Deinking, Papermaking Science and Technology Series, Fapet Oy, Helsinki, Finland, Ch. 10, 358-438 p.
 Nazhad, M.M., Ramos, L.P., Paszner, L. and Saddler, J.N., 1995. Structural constraints affecting the initial enzymatic hydrolysis of recycled paper. Enzyme and Microbial Technology, 17:68–74. Wistara, N. and Young R.A., 1999. Properties and treatment of pulps from recycled paper. Part I. Physical and chemical properties of pulps. Cellulose, 6: 291-324. Hubbe, M.A., Venditti, R.A. and Rojas, J.O., 2007. What happens to cellulosic fibers during papermaking and recycling, A Review. BioResources, 2(4):739-788. Laivins, G. V. and Scallan, A. M., 1996. The influence of drying and beating on the swelling of fines. J. Pulp Paper Sci., 22(5):178-184. Rudi, H., Ebrahimi, G., Hamzeh, Y., Behrooz, R. and Nazhad, M. M., 2012. Deposition of Cationic and Anionic Starch on Recycled Fibers by Layer-by-Layer Technique, PhD Thesis, University of Tehran, February. 127p. (In Persian). Dence, C.W. and Reeve, D.W., 1998. Pulp bleaching: Principles and Practice. TAPPI Press, Atlanta, USA, 582 p.
 Bengtsson, G., 2005. CTMP in production of high quality packaging board. International mechanical pulping conference. Olso, Norway, p 7-13. Sjostrom, L. and Odberg, L., 1997. Influence of wet-end chemicals on the recyclability of paper. Papier, 51(6):69-73.